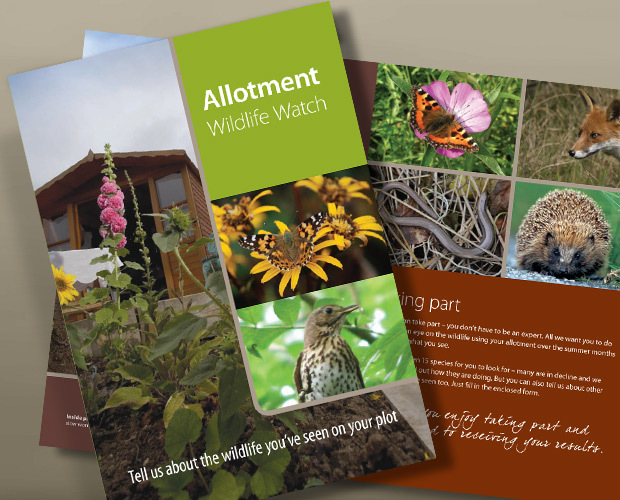 Bristol City Council asked us to design direct mail for local people to monitor allotment wildlife. Bristol has more green spaces than any other British city and a wealth of urban wildlife. There are over 80 designated wildlife sites in the city most of which are managed by the council. Bristol Parks is working to look after its parks for wildlife and to increase people’s enjoyment and understanding of wildlife in the city. OBJECTIVE: To invite allotment owners in Bristol to monitor and record wildlife on their allotments. In partnership with Avon Wildlife Trust, the Allotment Wildlife Watch is helping to deliver Bristol’s Biodiversity Action Plan. OUR SOLUTION: We created a six-page A5 leaflet containing an A5 reply postcard, with an uncoated natural finish, using a bright and rich earthy colour palette. At Inkwood we are passionate about conservation and the environment, and believe that to offer intelligent and engaging design you need to fully understand and relate to the subject matter and the client you are creating for. Therefore working with like-minded clients, suppliers and associates is the key to our unique approach. We are based within the beautiful Gordano Valley, close to Bristol. We'd love to hear from you about your next project!